Grand Day! Sorry, Kid . 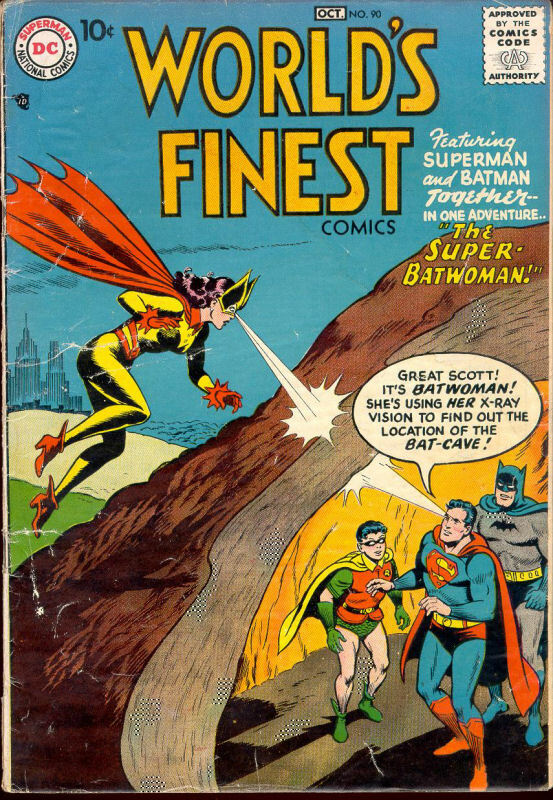 . .
As a kid, I loved comic books and the one I loved the most was DC’s World’s Finest Comics. It had originally started as New York World’s Fair Comics, in 1939. 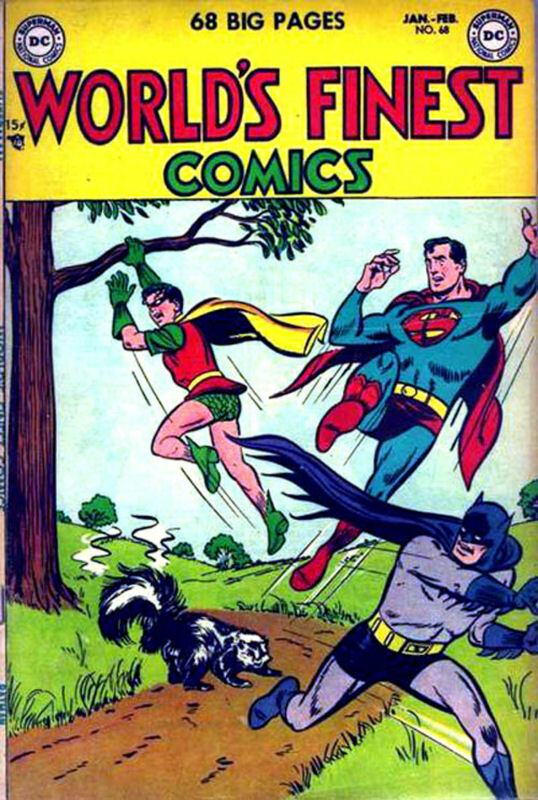 Then it became World’s Best Comics and finally World’s Finest Comics. Its early issues were 96-pagers, but soon settled in at 76 pages for fifteen cents for many years. 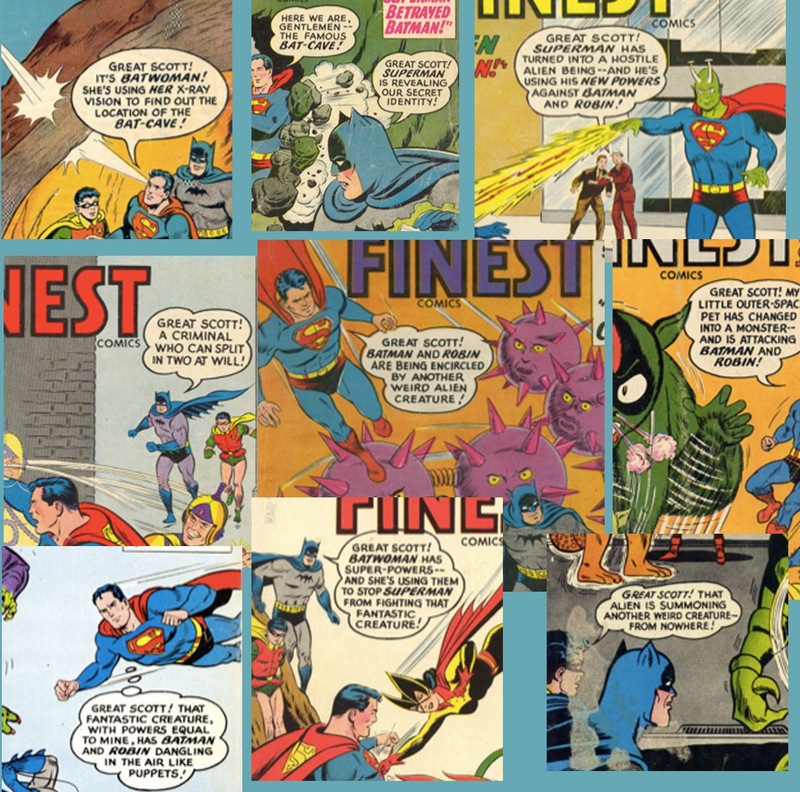 Superman and Batman each had their own stories, along with a bunch of lesser characters. 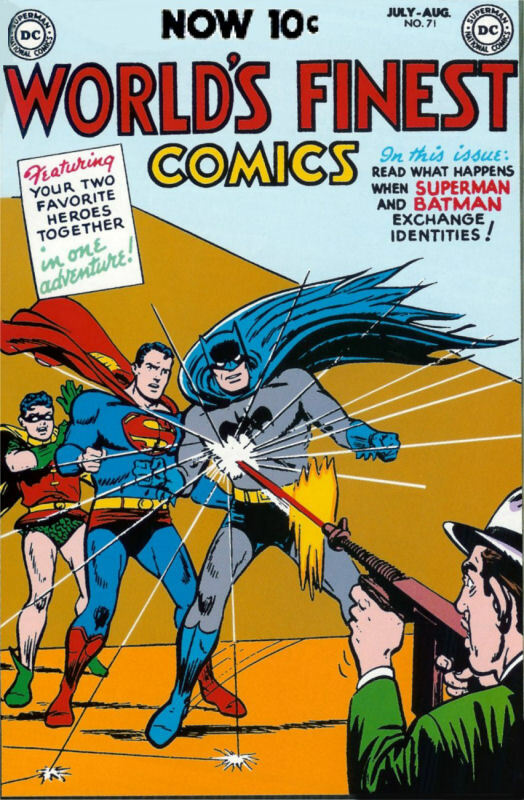 The covers showed Superman and Batman together in a poster setting that had nothing to do with the contents of the books. All this was way before my time. The page count began slimming down by the late 1940s, as seen here, but the price stayed at fifteen cents. I have to wonder how many of these comics were sold at a dime, since that was the going rate for a comic book. In 1954, when things got tough for comics publishers, DC changed the format to 36 pages (including the covers), cut a lot of the secondary features and reduced the price to ten cents, like most all other comics. 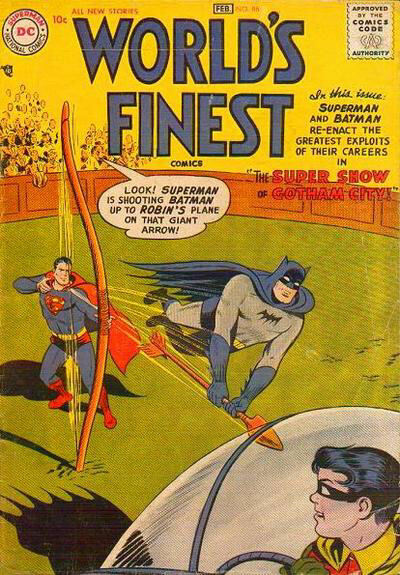 They also combined Superman and Batman into one story, which seems an obvious move after all those previous covers showing them both together. Those are the comics I loved; they gave great value for your dime. The art was crisp and well-drawn; the stories were interesting with intriguing plots. And the idea of superheroes being friends was wonderful to a kid. The Justice League of America, which came out a few years later, had most all the DC heroes, including Superman and Batman, but the art was lame and the stories confusing with seven or eight heroes bouncing around. 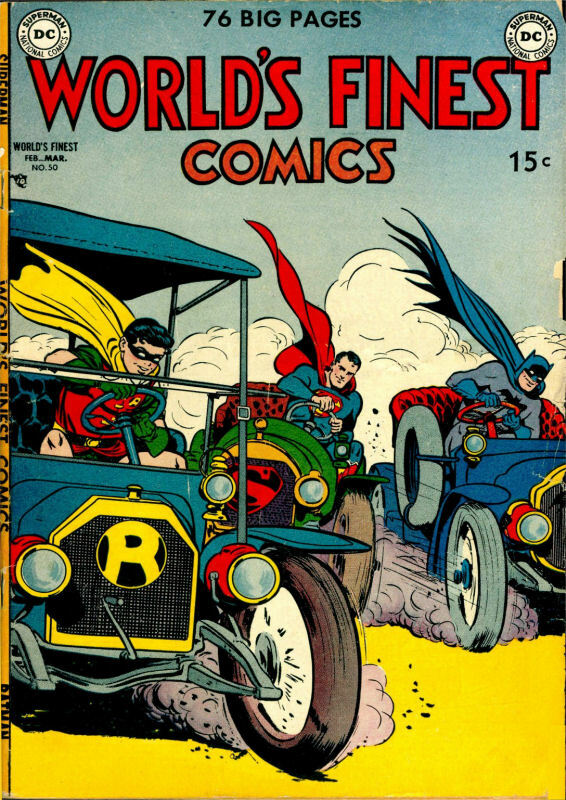 World’s Finest was more to my liking. Now, too, the covers related to the stories found in the issue. 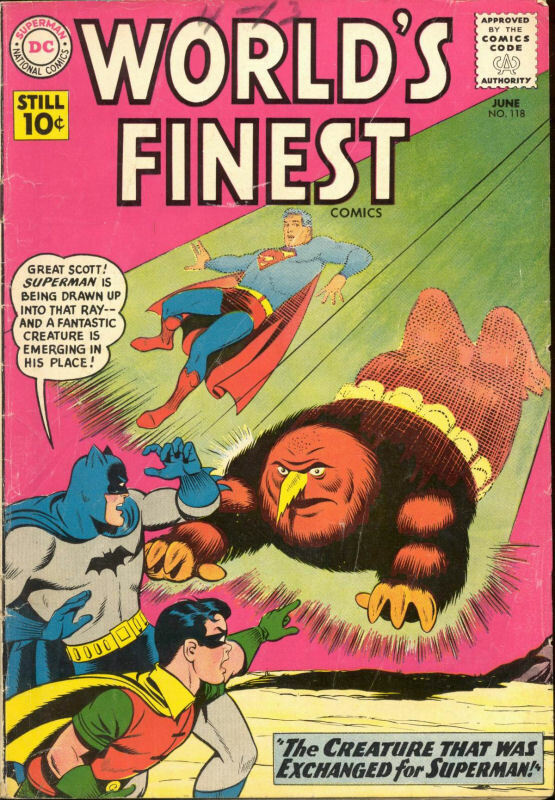 For about 50 issues, World’s Finest Comics were a real hoot, and there were two things about the covers I really liked. Usually, someone (Superman, Batman or Robin) would exclaim, “Great Scott!” at whatever was going on. And Robin, being rather a fifth wheel, would often be stuck in the bottom corner of the cover. My favorite covers had both the Great Scott! AND Robin in the corner. 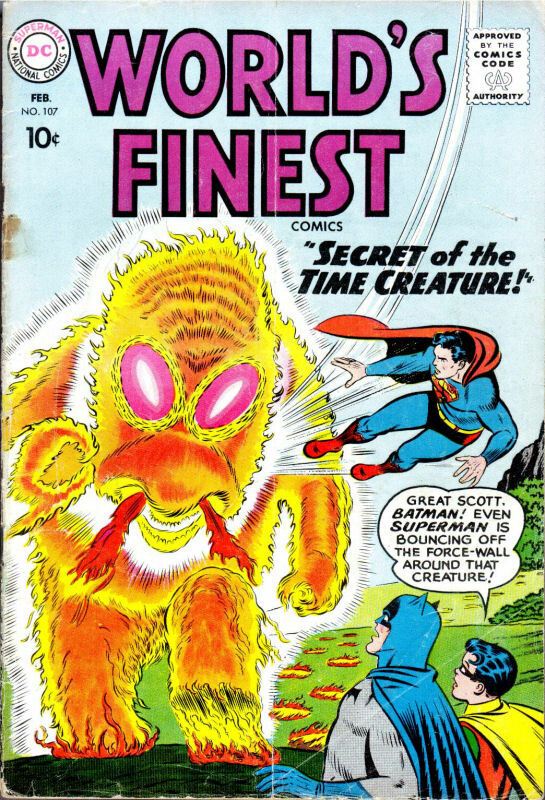 I don’t believe I’ve ever heard a real person say, “Great Scott!” but comic books were aimed at 12-year-olds, and the publishers had to be careful. The very early Superman used a lot of “What the–“ exclamations, and the reader could fill in the blank but that only lasted a couple of years. Thus, “Great Scott!” And see that “Still 10¢” in bold type on the pink cover? That was a hint that something was in the works at DC, and it wasn’t good. After a while, someone at DC must have issued an order about these recurring items, and Great Scott! was replaced with a couple of Great Kryptons! or Great Guns! and once even with a Great Gosh! 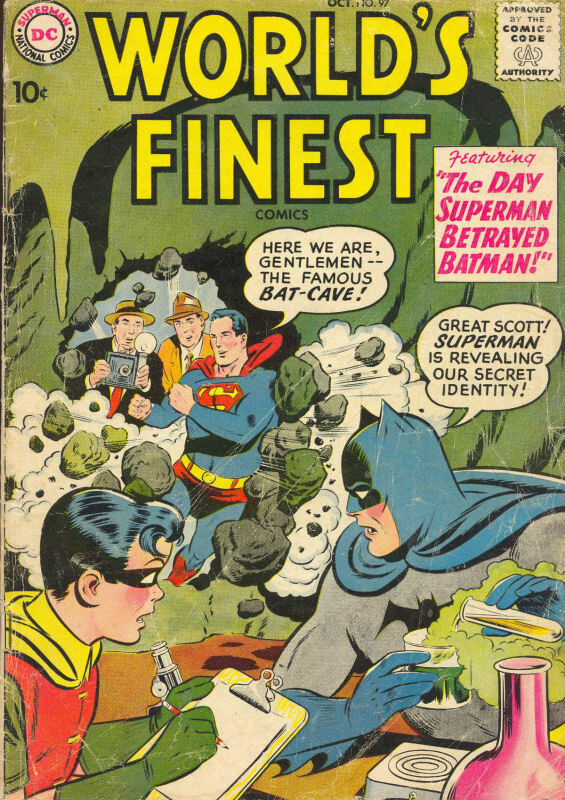 Robin, instead of being stuck in the corner, was just left off the cover entirely as often as not. By then the comics had gone up in price to twelve cents each (that previously noted “Still 10¢” really meant “Not Yet 12¢”) and the art wasn’t as lively or well-drawn as it had once been. It was the end of an era.